Ages 3 through adult. FlashPro Teaching Pix2 has been upgraded to include over 10,000 digital color photographs in 65 different categories. You can show or print 1, 2, 4, 6, or 8 pictures at one time with or without a printed word. Dozens of pictures of common verbs are included. Pictures look great when printed out in color or black and white. The program runs directly from the CD and does not require installation. Requires a CD-ROM and Windows 95 or higher. The CD is packed with photos in a variety of categories! You don't even have to install this program - Just put the CD in the computer and follow the simple instructions. Just click on the names of pictures you want to preview. To print, just click on the printer button on the screen. It can't get any easier than this! Save $19.00 on the software NOW. Save $68.00 when you order our special COMBO Pack! 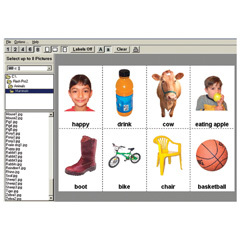 Get the Book of Picture Symbols for Everyday Communication, a $59.00 value, for only $10.00 when you purchase this book and the software at the same time! The book includes a comprehensive collection of over 3,000 symbols from the Library of International Picture Symbols (LIPS), Picture Symbols in the book target Food/Mealtime items, Clothing and Grooming, Household Items (Kitchen, Bathroom, Furniture, Appliances, Electronic Devices and Accessories, Home Maintenance, Residential Structures and Their Components), Transportation (Vehicles, Transportation Signs), Work and School (Titles, School Time, School Items, Job Titles and Duties, Office Items, On the Job), Leisure (Music and Dance, Toys, Games and Rides, Ball, Water, and Ice Sports), Personal Training, Hobbies, Recreation, and Entertainment, Family (Family Relations and Ceremonies), Health and Medical, Life in the Community (Around Town, Bank and Post Office, Shopping, Social Activities and Behaviors, Social Communication, Phone and Emergency Numbers) Basic Needs Statements and Questions, Animals, Insects, Environment/Nature, People and Culture (e.g., festivals), Colors and Shapes, Letters, Numbers and Measures, Location Words, Time and Calendar, Mood and Feeling Words, Descriptive Words, Action Words, Computer and Internet, and MORE. Use the illustrations from the book in conjunction with the photos from the software in your instructional programs. The book will be helpful in developing communication displays and instructional activities for individuals with communication disorders, augmentative communication needs, and second language learners. Individual pages from the book may be reproduced for use with students. This is a must-have resource for instructional programs. You'll find picture symbols in this collection that you won't find anywhere else. Save money by ordering the book and software at the same time. You won't find this special anywhere else! Important: Select the "Add-on" book option if you also want the book. You'll save an additonal $49.00. NOTE: Discount coupons and discount codes will not be applied to this item because it is already significantly discounted.